In what’s sure to be a blow to convenience store umbrella sales, a company in Vancouver has created the world’s first automated umbrella sharing service that lets members borrow one whenever it starts to unexpectedly rain outside. 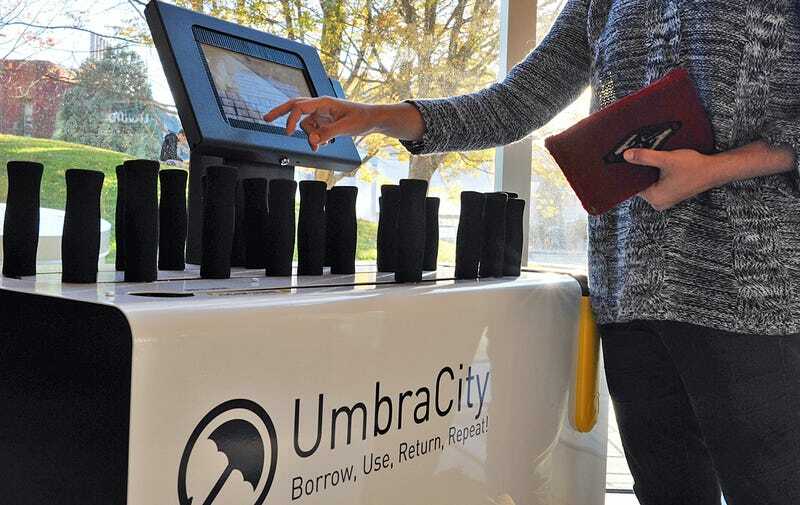 Like with bike sharing services that have seen limited success in cities around the world, UmbraCity first requires users to sign up with a credit card and their email address so that it can track when an umbrella’s been borrowed, and when it’s been returned. Signing up is completely free, and so is borrowing an umbrella for less than 48 hours. As long as you return it to one of multiple kiosks in under two days, you can keep on borrowing UmbraCity umbrellas forever without ever incurring a single charge. But after 48 hours is up, you’ll be charged two bucks for each additional day you’ve borrowed one, up to a maximum of $20. If you’re the type who’s awful at checking the weather forecast when you leave in the morning, and always find yourself buying a cheap umbrella while you’re out to avoid getting soaked, UmbraCity could be a lifesaver—or at least a dry clothes saver. It might be less useful for those who are prone to losing umbrellas, though, given the charges that kick in if one isn’t returned in time. Interested in trying the service out? Unfortunately for the time being it’s only available on campus at the University of British Columbia just outside Vancouver, Canada. However, if it proves to be a success, the company will hopefully expand its services to the rest of the city, which is known for its constant rain, and then maybe even internationally since bad weather doesn’t just happen on the west coast of Canada.